Planning a Halloween party and need some ideas for some spooky treats or appetizers? Here is a list of easy and fun appetizer ideas that will satisfy all your ghoulish party guests! In honor of the upcoming spooky day, I have rounded up some fun Halloween themed food, treats, and snacks for your haunting pleasure or spooktacular party! These Halloween food ideas are perfect for your Halloween party or simply for making a family meal a little more ghoulish. These all look like fun to make and serve. I can just imagine a whole table full of fun recipes like this for Halloween. I have made several of these before but there’s some fun new ideas for me. I want to make the pizza ghosts. These treats are giving me some great ideas. I love Halloween and making one of these for the kids would make the day speecial. Oh my gosh these are adorable! I think we need to make these for Halloween this year before we go trick-or-treating. I know all the kids would love it and it’s funny creative to do. 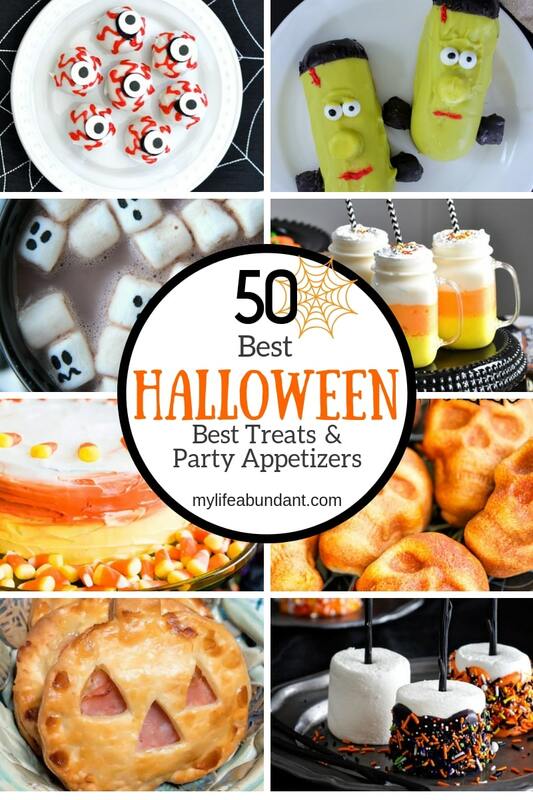 These are great Halloween party ideas. I love the veggie tray skeleton. I might have to give that a try during our next game night. We are always looking for fun new ideas to try while hosting. These recipes looks like so much fun to make. I can’t wait to give a few of them a try. I can’t wait to sit down and share these with my son. Since he wants to prepare Snacks for the staff in his school your list will make it easy to figure out what to prepare. I love all of these. I’ll have to make some of them with my kids. They’d get a kick out of most of these treats. 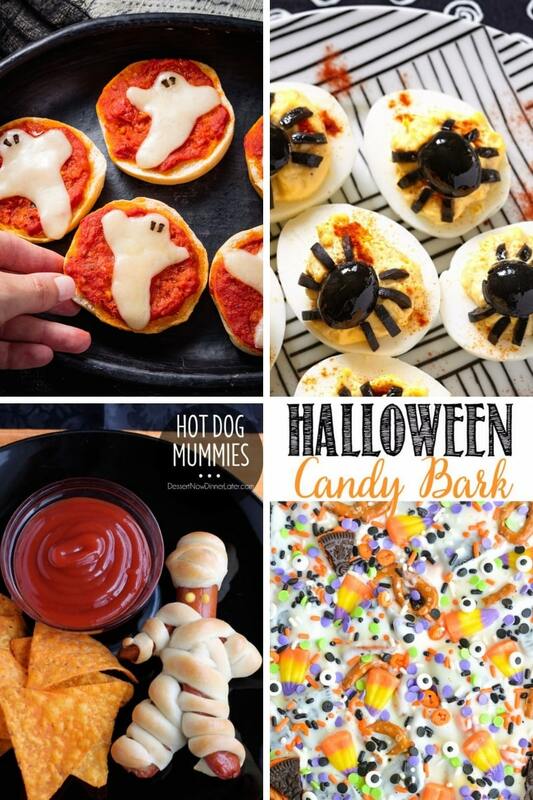 These are all so creative and look delicious too! 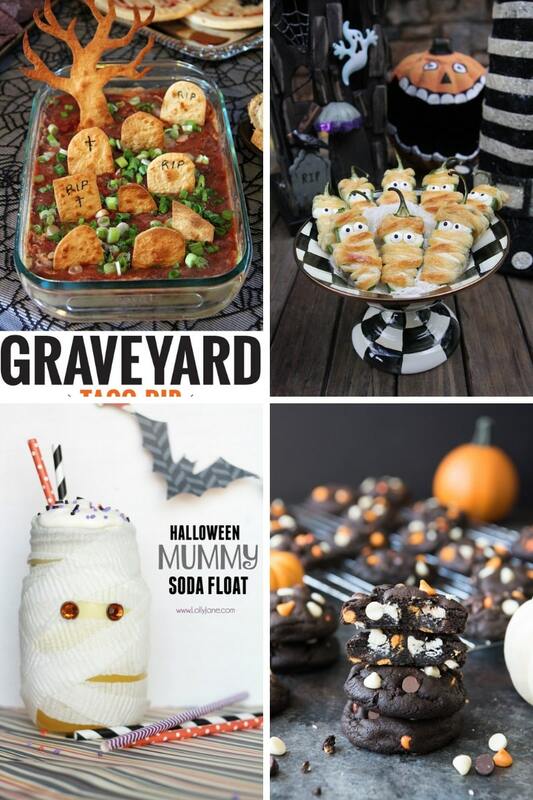 We are having a Halloween party and I definitely want to try a few of these for the party, thanks for all of the ideas! I feel like I’ve failed as a parent seeing all of these awesome Halloween treats! I’m going to have to make some this year. These are really cute. There are so many fun options that won’t take up too much time. I loved the mummy dogs. Too cute. I would have fun eating those. 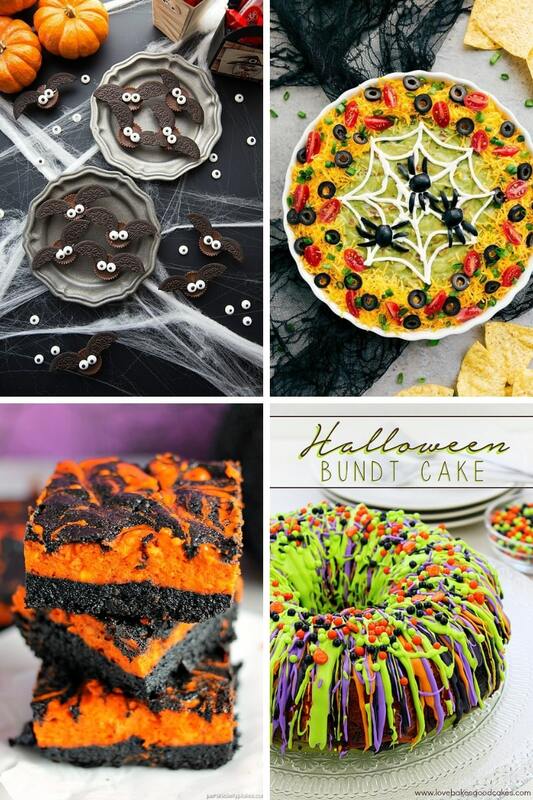 I am also in love with that Halloween bundt. Oh my! These look like so much fun to make and eat. I’m sure kids will go crazy for these. I’m totally sharing these with all the mothers in PTO I know that will be doing Halloween parties this year! My son is in Junior High, and I always miss doing his Halloween parties every year. By far, my favorite. Now those are some great Halloween treats. I would take any of those and my kids would love them for sure. All these colors! All these ideas! My kid will go crazy over these! We will try some of these for Halloween this year! There are so many amazing Halloween ideas here. I bet my girls would LOVE that mummy float idea. So fun and festive. Oh wow! 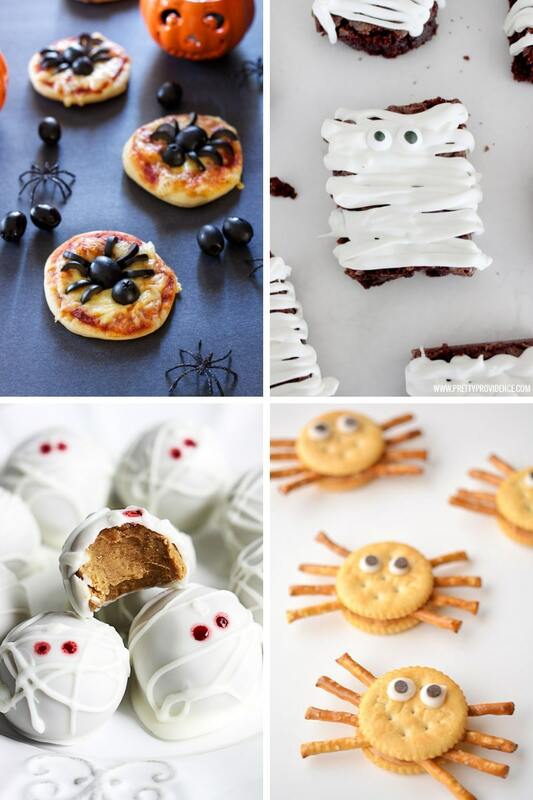 This is an amazing roundup of halloween treats. The pumpkin stuffed peppers look delicious! This is the spoooookiest round-up of Halloween treats I’ve ever seen. I am so impressed with peoples creativity with food. I might have to try making one this season… they’re too cute! 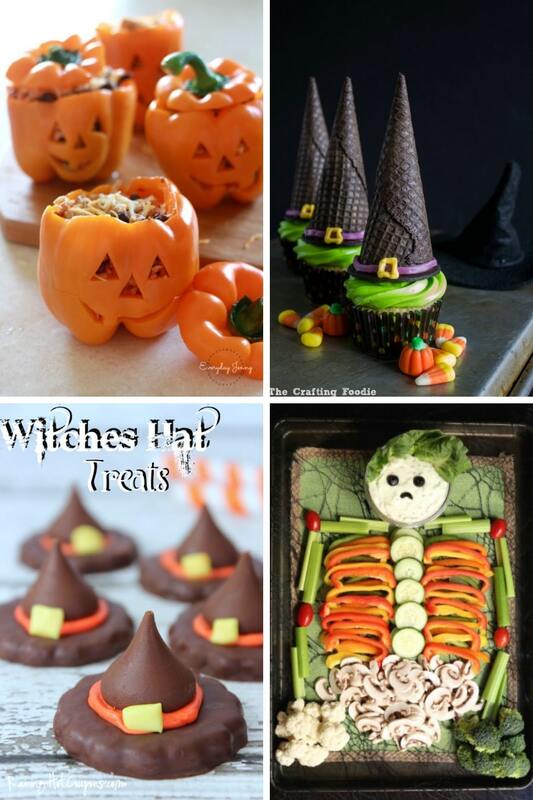 What a wonderful variety of Halloween Treats and Party Ideas! Thank you for sharing at Happiness is Homemade.